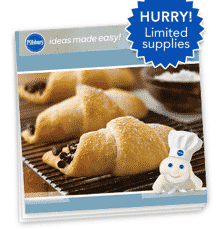 If you’ve been a Pillsbury Member email subscriber as of 11/4, click here to visit the Pillsbury site and you’ll be able to request a free calender. Allow 6-8 weeks for delivery. If you aren’t a member, no worries. Just signup up today and you’ll be eligible for future free samples from them. Got it! This was a really nice calendar last year.. I convinced my wife to use it instead of buying one, as we normally do.